Velociraptor 3d night light led light remote control: red, green, blue, yellow, cyan, pink, white with one color mode or 7 color gradual changing mode. This desk lamp is a fantastical unique item that makes the perfect gift for kids,adults,families and friends for all ages. 3d panels plastic makes it safe and never do harm to eyes. Battery is not included (3*AA)in the box. 3d night light for kids: A unique indoraptor birthday gift for girls that everyone will love. The BEST night lights for ADULTS, KIDS and BABIES who comes alive in the dark. 3D optical illusion which is with soft 7 LED light spreads light through samll acrylic panel and it is not so dazzling.in the dark. 3D optical illusion which is with soft 7 LED light spreads light through samll acrylic panel and it is not so dazzling. 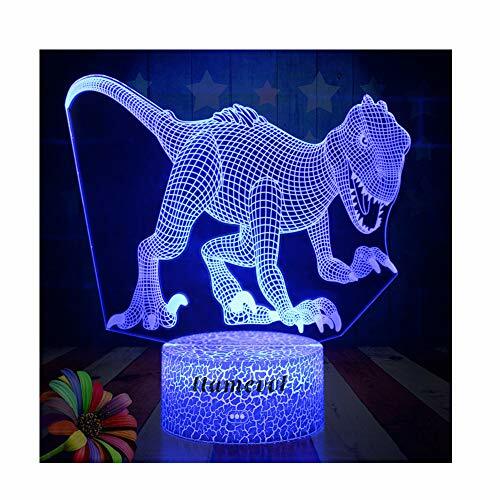 3d dinosaur lamp is great gifted for the following: office gifts, christian gift, christening gift, family gifts, gardening gifts,christmas gifts, baptism gift, baby gift, holiday gift, Thank you gifts, Thanksgiving gift, sympathy gift and all seasonal gift. It is perfect animal lover gifts. LAST MINUTE GIFT IDEA FOR HER or ROMANTIC BIRTHDAY GIFT for Mom or MOTHERS DAY. Dinosaur party supplies: It is ideal placed on a table,desk or night stand in a NURSERY in playroom or kids bedroom, 3d lamp shade is a great decoration for the house for all ages, it also can be taken as a party decoration for kids and toddlers, they will love this child night light very much, it is very versatile. 3d dinosaur is powered via USB cable(include) or battery(not include).You could also plug into a POWER BANK making it even more portable. kids night light is energy saving with spec of 0.012kw.h/24 hours and 10000 hours of life shelf. Dinosaur light：Please tear off the protective film on the surface of panels before using and clean it off if your finger print is marked. Please contact us if you have any problem. If you have any questions about this product by LLAMEVOL, contact us by completing and submitting the form below. If you are looking for a specif part number, please include it with your message.